The Austrian-American botanist, author and explorer Joseph F. Rock arrived in the town of Lijiang in southwest China in 1922. He remained there for almost thirty years, studying and documenting the animist culture of the local population, the Nakhi. The Nakhi people are no longer an isolated tribe: Lijiang has seen an influx of Han Chinese, who have exploited the cultural contrast with the surrounding region and turned the town into a tourist attraction. These profit-driven characters moved into the Nakhi’s traditional timber dwellings with slate roofs and donned traditional Nakhi costume. They gave the original inhabitants concrete apartments in the new part of the town. The Nakhi thus became a curiosity, without ever being put on display in the flesh. Almost eighty years after Rock, Saskia Janssen also stayed in Lijiang. She analysed the situation there and translated it into several works that combine to provide a faceted portrait of the place. Intrigued by the cultural transposition that has occurred there, Janssen committed field recordings she had made in both sections of town to a gramophone record: East/West, Paradise in Reverse (2005). Like a traditional east/west dichotomy, the old and new town shall remain far removed from each other even though both quarters are known as Lijiang, in the same way as it will never be possible to listen to the A- and B-side of an LP simultaneously. However, if you take in the sounds, sharp timbres and songs on the record, then there proves to be no actual difference between here and there, left and right: East/West, Paradise in Reverse is an ode to that same tangle of cultures and describes what at first glance seems like a cultural falsification. Our romantic notion of an ‘unspoilt culture’ might need some modification, according to Janssen. Even culture is subject to ‘evolution’. If they ever existed, the original, paradisaical or ‘ideal’ conditions will never again be attained, and perhaps that is not even desirable, seeing as the Nakhi themselves do not mourn the ‘loss’ of a lost past in the least. As the project’s title might lead one to suspect, Janssen’s position is analogous to Robert Smithson’s in his travelogue, ‘A Tour of the Monuments of Passaic, New Jersey’, in which he describes abandoned pipelines and foundations for buildings that, even though are yet to be built, have already fallen into disuse as the romantic ruins of today. [i] It is a baseless Utopia, or ‘ruins in reverse’. 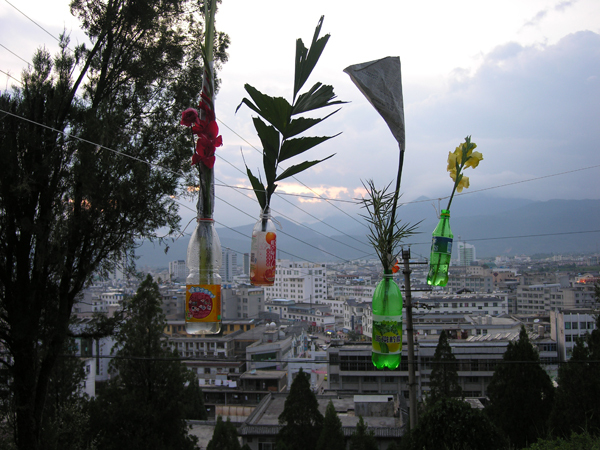 Janssen marked the mountain ridge that divides east Lijiang from west with a garland composed of artificial and natural flowers. The unusually mixed bouquet and its placement provide insight into what the Nakhi and Han Chinese noted earlier: in this paradise we live together and that paradise is now. The quasi-impossibility of capturing diverse perceptions of a specific time and place in a single image seems to be inherent in all Janssen’s projects, whether in East/West, Paradise in Reverse (2005) or Blaka Watra Spiders (2008), Casting Fortune (2004) or Peter Stuyvesant’s Ghost (2006). In the works themselves this is made evident by the engaged dialogue with the other, the human subjects she is documenting and with whom she at the same time documents a situation. Janssen invites the various participants to take a range of positions, within the work but also with regard to the work. 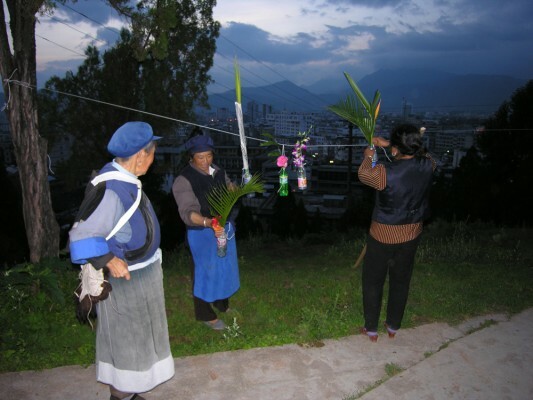 In Lijiang, for example, she created the frontier of flowers with the Nakhi women, while the visitors to Blaka Watra, a drop-in centre for drug addicts in the heart of Amsterdam that she visited regularly, played an active role in the realisation of Blaka Watra Spiders. In this project Janssen translated her experiences and observations at the drop-in centre into images more starkly estranged from the situation in which they originate. For many people Blaka Watra is a rather uncanny place that is primarily frequented by African-Surinamese drug addicts, people who migrated to the Netherlands in the wake of Suriname gaining her independence in 1975. Inspired by experiments with drugs by an Austrian pharmacologist, Dr Peter Witt, and by the manifest compulsion of the drug users to sketch, Janssen asked them to depict a spider’s web and say something about it. Hidden talents and suppressed stories were brought to light and aired: with Janssen’s help the users sketched their own portraits. The images that emerged at a later stage in her studio are reminiscent of the colourful installations by Franz Ackermann, in which the artist’s travels, his stretched conception of time and space, are condensed. For example, Janssen folded huge fans from the drawings on paper produced by Blaka Watra’s visitors and used them to construct slowly rotating, upright ‘wheels’. These works serve as a counterbalance to the sometimes frenetic attempts of drug users to banish the slightest draught from their place of abode. The concentration of the working process is shared in these soaring sculptures, with which the visitor, given the human scale of these works, can easily identify. If we consider Janssen’s presentations then these also convey the idea of time and space as something essentially heterogeneous. In Smithson’s work the configuration of an unambiguous ‘place’ is immediately called into question, as is already evident from the terminology used to refer to the time-space vector,[ii] but according to Ackermann the absence of the static locus has now deteriorated into a general feature of existence: ‘From place to passage: the physical movement is getting more and more existential.’[iii] The beholders of East/West, Paradise in Reverse found themselves in the midst of a constellation of, among other things, the gramophone record that could be listened to quietly via headphones, photos of a reconstruction of a shamanistic altar from 1922 that was installed in east as well as west Lijiang, and a video recording of an ode to the old town performed by two female nightclub singers. [iv] Thanks to this multitude of images in the exhibition space it was not only possible to re-embody Lijiang and provide a representation of the place that Janssen felt was faithful, but the visitor was at the same time able to find a personal inroad into the ever-spreading network that was implicit in the condensed presentation. Janssen explains that at the outset she never knows what or who she will happen upon in the situation that she is portraying. The ingredients and eventual form of a project are dictated by the actual encounter with the place and the interaction with the people who determine the situation. You might describe her as an orchestrator/director, though never of languid pawns, Janssen hastens to add. The conversation, that organic interplay of question and answer, statement and response, is an integral part of her approach. Within the dialogue Janssen’s curiosity can prevail. Besides, in this dialogue there is a place for the commensurate interest of the other in her. For is not the artist, like the drug user and indigenous peoples, a classic eccentric, a singular and marginal figure in a society regulated by codes, rules and fixed categories? Charles Baudelaire, that poet of modern life, has already sung the praises of wine and drugs, art and travel,[v] as well as the transience, which should not be underestimated, of what is nowadays termed their beauty. [vi] If one attempts to tie down or institutionalise this facet then it evaporates. Likewise, in Janssen’s work ‘pure reality’ reveals itself to be rarefied or ephemeral and, as noted, is impossible to capture in a single image. The continuous discourse that she pursues is typified by a comparable fleetingness on which it is well-nigh impossible to gain a hold. It is this spoken and inherently temporary element in Janssen’s work that lays bare the onlooker’s story: clichés are revealed and ways of thinking are qualified and even undermined, thus exposing the vacuity of truisms in particular. In Janssen’s view, the state of uncertainty, the radical ‘other’, offers unexpected and ever-changing perspectives and horizons. The fact that predominantly rational discourse clouds the gaze and erases reality is evident in Peter Stuyvesant’s Ghost (2006), a site-specific project realised in New York. The slave songs recorded by Janssen, sung and recited by Ebby Addo and Totty Telgt, both of them visitors to the Blaka Watra drop-in centre, could be listened to at telephone booths in the East Village where the ancestors of the two were most probably forced to work as slaves by landowners. A history obscured, deliberately or not, is rendered discussible in Peter Stuyvesant’s Ghost, the trance of the songs transporting you to another reality. ‘Remember me, remember me,’ the singers hum aloud. Everybody sings their own song about their own lives. Cultures and personal histories are chronicled and corrupted, according to Saskia Janssen. Behind each and every façade there are stories hiding; nothing is what it seems. [i] Robert Smithson, ‘A Tour of the Monuments of Passaic, New Jersey’ (1967), in Jack Flam (ed. ), Robert Smithson: The Collected Writings (Berkeley, Los Angeles and London: University of California Press, 1996), pp. 68-74. [ii] Heterotopias are ‘works that “simultaneously represent, contest and invert.”‘ See Suzaan Boettger, Earthworks. Art and the Landscape of the Sixties (Berkeley, Los Angeles and London: University of California Press, 2002), p. 46. [iii] Nicolas Bourriaud (ed. ), Altermodern. Tate Triennial (London: Tate Publishing, 2009), p. 42. [iv] The exhibition was staged at Ellen de Bruyne Projects in Amsterdam, 15 October-19 November 2005. [v] For example, in the series of poems titled ‘Le Vin’, ‘Le Poison’ (L’opium agrandit ce qui n’a pas de bornes – Opium magnifies that which is limitless), ‘Les Phares’ and ‘Invitation au Voyage’, respectively, in Charles Baudelaire, Les Fleurs du Mal (Paris: Librairie Générale Française, 1972 [1857/1861]). [vi] Charles Baudelaire, ‘Le Peintre de la vie moderne’ (1863), in Claude Pichois (ed. ), Charles Baudelaire, Critique d’art (Paris: Editions Gallimard, 1976), pp. 343-384. [vii] From God’s Angry Man (1980) about Dr Gene Scott, an American TV preacher, to Encounters at the End of the World (2007), about the hidden world of scientists in Antarctica.